Back today after not being able to find time to post anything to our site yesterday. It was Good Friday and the wives kept us busy. Another low-scoring night yesterday, especially in the last two games with just 5 goals combined by the Blues, Wild, Sharks and Oilers. In fact, if it weren’t for the Canadiens’ late goal to tie the Rangers 3-3 last night (Montreal eventually won 4-3 in OT, a massive win for them), none of the 12 games so far would have gone Over the total. We’re looking for those goal-scoring numbers to go back the other way soon, and that already started this afternoon as the Bruins and Senators are tied 3-3 as we write this post. Two opinions for tonight. Not much time for writeups so they’re a bit abbreviated. Good luck and enjoy the games! The Capitals got a serious wake-up call in Game 1, looking like crap in the first period and lucky to get out of it trailing just 2-1 after the Leafs struck for a pair of early goals. Washington went on to win that game in OT and we think the Caps will carry that momentum – and a bit of the weight being off their shoulders – into tonight. 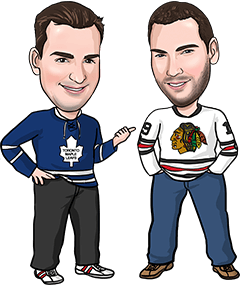 Both of us are Leafs fans and think Toronto can give Washington a better run than most people expect, but they’re more likely to do it at home at the Air Canada Centre. Capitals are such a dominant home team and we expect a much better performance from them tonight. When teams lose Game 1 in the Stanley Cup playoffs – especially a heavy fave like Chicago – it seems that they focus most on improving the area of their game that was the weakest. For the Hawks, that should mean generating more offence after Chicago was blanked 1-0 in the opener. We think the Blackhawks get a bit more urgency and aggressiveness in their offensive play tonight. At the same time, the Preds play tonight with confidence from Game 1 and can be nice and loose after already stealing back home ice in the series. Let’s hope for both teams to play a bit more free-flowing game tonight.